This is an open call to join carpentry workshops in Narrow Way run by RARA, a Clapton based cooperative of architects, designers and makers. 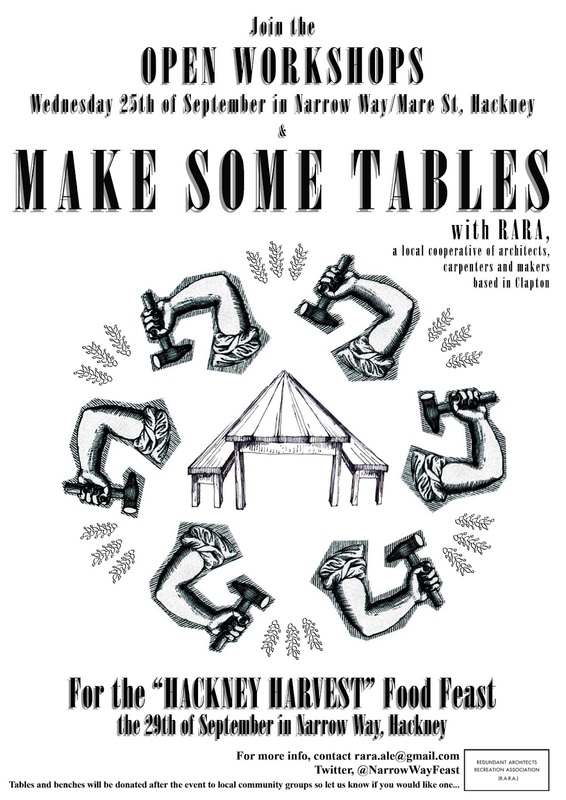 The workshops will involve building 30 tables and benches for the ‘HACKNEY HARVEST’ Street Feast, happening Sunday 29th September. The workshops will take place in the streets of Narrow Way on Wednesday 25th September from 10am to 4pm. We are interested in working with people in Hackney of various ages and skills. Our team of professional makers and designers will share carpentry skills and induct people to safely use hand tools. There will be activities suited to a range of ages and capabilities. 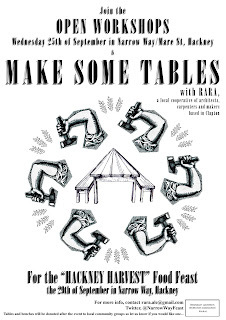 The tables will also be donated to groups in Hackney after the feast. Please get in touch if you are interested in having one of them.